MSI CX623—Enjoy Next Generation Multimedia Today: MSI just unveiled the newest member of its Classic series of notebook computers - a 15.6" model with a high end nVidia GeForce 310M discrete graphics card (DDR3 1GB VRAM) and the all new Intel Core processor, so you can enjoy next generation multimedia performance today. 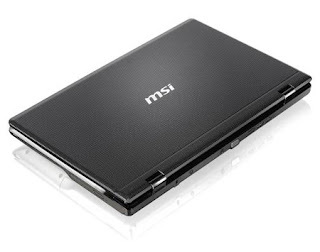 The CX623, the 15.6” laptop with discrete graphics card recently added to MSI's Classic series arsenal, just hit the market. Equipped with the latest Intel Core processor and the nVidia GeForce 310M discrete graphics card (DDR3 1GB VRAM), the CX623 offers the best multimedia processing capabilities out there. What's more, the CX623 comes with MSI’s own color film print coating with cross-hatch design and MSI's chiclet keyboard, accentuating its minimalist, stylish exterior. Syclo a leading provider of mobile enterprise software, announced today the release of two new mobile applications in support of SAP® solutions for use with BlackBerry® smartphones. Unveiled at the SAPPHIRE® NOW conference, the new Syclo SMART Service Manager, and SMART Approvals Manager solutions help companies extend their use of the SAP® ERP and SAP Customer Relationship Management (SAP CRM) applications to BlackBerry smartphones. The new applications take advantage of Syclo’s close co-innovation partnership with SAP AG, membership in the BlackBerry® Alliance Program, and years of experience in creating flexible, high-performance, scalable and resilient mobile applications for use with SAP solutions. Pandorex GameBox Bringing The Theater Experience Home For Gamers: The Pandorex GameBox is a sit-down arcade for gamers that doubles as an entertainment center. Engaging gamers and movie buffs at a higher level than ever before with the theater experience in comfort of their own home. Pandorex GameBox is entering the gamers market with a unique twist of an entertainment center. 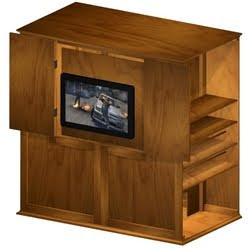 Made out of real wood and not particle board, this entertainment center stands tall against other entertainment centers as it doubles as a sit-down arcade for gamers, or if you are a movie buff, your own private theater in the privacy of your own home. New Pink LUXslim Aluminum Laptop Case by MEZZI Merges Style and Function: MEZZI, a leading manufacturer of aluminum briefcases and other cases, is pleased to announce a bold addition to its product line: a pink LUXslim Aluminum Laptop Case. The LUXslim laptop case features a padded ergonomic shoulder strap, ample space for a 17-inch-screen laptop and accessories, and a three-digit central lock combination for added security. The release of the pink LUXslim laptop case comes at a time when women make up a substantial segment of the business world. Women comprised 46.5 percent of the total U.S. labor force and are projected to account for 47 percent of the labor force in 2016, according to the U.S. Department of Labor. In addition, women own approximately 50 percent of all U.S. businesses. Products like MEZZI’s aluminum laptop cases are helping female business owners, professionals and consumers increase their mobility and productivity. MEZZI has been designing and manufacturing aluminum briefcases and other cases for more than 15 years. The MEZZI product line has gradually grown from a few cases to a full array of cases for a variety of uses. Today, MEZZI sells an assortment of aluminum cases in different styles and sizes. It also sells the only molded aluminum gold chrome laptop case on the market, as well as WOODline aluminum cases with a stunning wood finish. 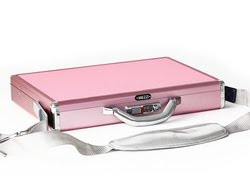 The MEZZI brand also encompasses specialty metal cases including: gun cases, art portfolio cases, makeup cases, cd storage cases, and business card cases. Over the years, MEZZI’s eye-catching brief cases have created quite an impression in the market place. Its products have been prominently featured in movies, television shows and music videos. MEZZI’s WOODline briefcase added a striking element to Mission Impossible III, a movie starring Tom Cruise. Its Slim Mold aluminum briefcase serves as a professional centerpiece on NBC’s hit show Deal or No Deal, and the M-Zero molded aluminum case is featured in Jay-Z’s Show Me What You Got video. Although the MEZZI brand is appreciated for its high style and quality, its products are reasonably priced to fit a broad market. For example, the new pink laptop case sells for $59.95, while the larger Traveler Edition Roller Aluminum Laptop Case, Artwork Portfolio Case and Muscle 26-inch Gun Case are priced at $89.95. Specialty cases start at just $9.95. Oransi’s New Ionic Air Purifier with Night Light Provides Odor Removal in Smaller Rooms in Home: The new filterless ionic air purifier for home from Oransi uses only five cents worth of electricity per month, yet silently keeps the air in smaller bedrooms or bathrooms fresher by providing odor removal. This new air purifier ionizer also features an LED night light – an added convenience for parents, kids and seniors at night. Oransi’s money-saving ionic air purifier is compact, portable, energy-efficient, fire resistant and easy to clean with no filters to replace. The new money-saving ionic air purifier with night light from Oransi is a silent air purifier ionizer providing light odor removal in smaller rooms throughout the home such as bedrooms and bathrooms. As an added convenience for parents, kids and seniors the ionic air purifier has a built-in LED night light. The new filterless air purifier weighs only one pound and plugs directly into any electrical socket. It helps keep air fresh in bedrooms and bathrooms up to 110 square feet. * Saves money – Uses on average only five cents worth of electricity per month. There are no additional filters to buy – an added savings over time. * Portable – Weighs only one pound and is a compact 9”x 3”x 2” – making it easy to move from room to room. * Easy to use – just plug it directly into electrical socket and turn it on. * Safe – The air purifier ionizer has no cords to endanger pets or crawling babies. * Fire resistant - Made of durable fire-resistant ABS materials. * Quick clean-up – washable filter plates make frequent clean-up quick and easy with just liquid soap and warm water. * Silent – makes no noise and won’t disturb people sleeping. * Eco-friendly – features a patented Piezo-electric ionizer that is ozone safe at 0.011 ppm - 78% below the FDA limit of 0.05 ppm. * Certified: CE, ETL, GS, RoHS. * Energy-efficient – features a cool LED night light that is energy efficient lasting on average between 50,000 to 100,000 hours. Uses only 1.6 watts, 115V, 60Hz.